It’s been a long year. So believe us when we say we’re ready for New Year’s Eve — that special time of year when counting in unison is fun, and exuberantly singing strangers seem kind of nice. Whether you celebrate in a packed club, alone under so many blankets, or up in space getting sauced with astronauts (more on that later), New Year’s is a special time on our troubled little planet. It’s our annual, international keg stand to honor Father Time. To celebrate the global New Year, and because a lot of us are working on NYE and need a way to rationalize some light day drinking, we’re clocking the arrival of 2019 around the world. Thanks to this incredible New Year Map from TimeandDate.com, it’s entirely possible to track who sees it first and who sees it last. In the spirit of global community, we’ve compiled 10 ways to celebrate as the day progresses, inspired by 30-plus destinations around the world. We based our timeline on Eastern Standard Time (ET) — not due to any East Coast U.S. snobbery, but because that’s where the ball drops in NYC’s Times Square. Besides, we all need a starting (or ending?) point. If you’re on America’s East Coast you’re currently cursing at your alarm (New Year’s Eve is a Monday? ), but Samoa and New Zealand’s Chatham Islands are 17 hours ahead and already celebrating. They’re the first to see 2019. Fiji celebrates an hour later, most likely because a poolside massage ran long. If you’re functioning at 6:00 a.m. and want to toast the South Pacific, you could whip up a quick tiki cocktail in celebration of that timeworn, all-American ode to Polynesian fantasia (here are drink recs from the pros). Or you could try to get your hands on kava, a beverage made from the roots of a plant found in Fiji and other South Pacific islands, and increasingly popular in the U.S.
Brunch-o-clock ET is when Tokyo and Darwin, Australia ring in the new year. Japanese New Year’s is traditionally pretty quiet, but you can honor Tokyo with a tumbler of Hibiki (since that whole “Japanese whisky shortage” thing isn’t likely to get better in 2019). Australians are deep into summertime by Dec. 31; if Outback commercials are to be believed, they’re mostly limbo-ing the days and nights away. You could limber up, or you could make like Oz’s own Penfolds winemaker Steph Dutton and drink all the Chardonnay. Beijing, which is 13 hours ahead of ET, will soon ring in 2019. Raise a celebratory shot of Baiju, the No. 1-selling spirit in the world. Fireworks over Sydney, Australia, which celebrates NYE at 10:00 a.m. ET. Whether it’s your lunch hour and you’re about to write an email foolishly titled “F this job, it’s New Year’s,” or you’re currently getting out of bed, think of Bangkok, Laos, Jakarta, and Vietnam, where the clock just struck midnight. The actual Thai New Year isn’t until April, but Vietnamese “Tet,” the Lunar New Year celebration, begins Jan. 1. If you can get your hands on Vietnamese sticky rice wine, or a bottle of Singha, here’s to counting down 12 more hours. Bangkok celebrates its new year at 12:00 p.m. ET. It’s officially New Year’s in Moscow, which means our national frenemy is already cheersing 2019 with a bunch of ice-cold vodka (we assume they’re careful when they celebrate, though, because they did run out of it that one time). If you have access to Champagne and fire, you could make like the Muscovites by writing a New Year’s wish on a piece of paper, burning it, and then dumping the ashes into bubbly. In Russia, they down the whole glass before the clock strikes 12:01 a.m. When celebrating NYE in Moscow, revelers write a New Year’s wish on a piece of paper, burn it, and pour the ashes into bubbly. They are then tasked with drinking the Champagne before 12:01 a.m.
At this hour, those of us in this time zone probably still have shreds of civility. But in Edinburgh, where 2019 has just made her 12:00 a.m. GMT appearance, revelers are deep in the clutches of Hogmanay, a three-day New Year’s celebration with ancient Norse, Gaelic, and French roots. Honor their inebriation by sipping on a smooth Macallan. Alternately, drink like a real-life Scottish bartender, or see if they have any of those Tiny Cans for Tiny Hands left available from Trump’s visit. Frankfurt, Paris, Prague, Warsaw, Madrid, Stockholm, and Amsterdam all hit New Year’s at 6:00 p.m. ET, so feel free to start your dinner with the Pilsner, Pinot, or, um, edible of your choice. When it’s midnight in Edinburgh, revelers are deep in the clutches of Hogmanay, a three-day New Year’s celebration with ancient Norse, Gaelic, and French roots. It’s midnight in parts of Brazil and Buenos Aires, Argentina, which probably means a lot of people are dancing really, really well somewhere. An easy way to honor the global celebration is to mix something light and fresh with Cachaca, the Brazilian spirit used in the Caipirinha. It’s somewhat similar to rhum agricole and unaged tequilas. Try it on ice, in a Caipirinha, or even as a stand-in for gin in a Negroni. Toast the new year in Brazil by drinking Caipirinhas and dancing really, really well. That’s you! Happy New Year! If you’re actually in New York and find yourself in Times Square (on a dare? ), godspeed. You need a drink. Any drink. 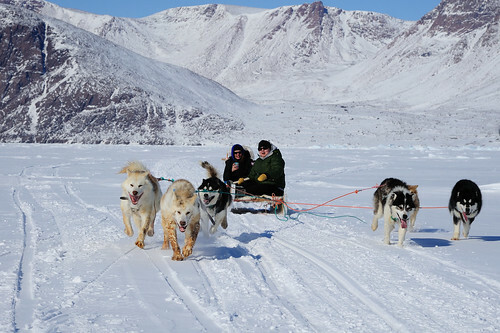 But it’s also New Year’s in Peru, Ecuador, Jamaica, Cuba, Montreal, and a super-northerly place called Grise Fjord, an Inuit territory in Canada that’s one of the coldest inhabited places in the world and has awesome sled dogs like this. So drink some Champagne, or Pisco, or some Appleton Estate, and toast to the pets and pours that keep us happy all year long. If you find yourself in Times Square at midnight in NYC, you likely need a drink. Any drink. If you’re on ET, you’re either rationalizing another cocktail or you’ve made the incredibly wise choice of finding greasy food to (maybe?) fend off the first hangover of 2019. It’s just turning into 2019 in L.A., Seattle, and (almost) Juneau. If you’re somehow still drinking, grab an Alaskan Amber or sip some of Juneau’s own Malaga gin. It’s also 2019 in a place called Pitcairn Island, a British territory in the South Pacific, which is interesting because it’s the only place we know of where pissed-off sailors comprise a significant portion of the population. (The volcanic island’s tiny population is descended from Tahitians and 1789 mutineers from the HMS Bounty, as in “Mutiny on the Bounty”.) You could toast Pitcairn with navy-strength gin. Seattle, Los Angeles, and Pitcairn Island, in the South Pacific, celebrate New Year’s at 3:00 a.m. ET. Only a couple of places still haven’t seen the new year, including American Samoa and Baker Island. Because time zones are so very arbitrary, Baker Island is a stone’s throw, Earth-wise, from Samoa, but they celebrate the New Year 26 hours apart. Neither of these Pacific islands is particularly known for its coffee (fun fact: American Samoa’s largest export is canned tuna! ), but probably that’s what you should be drinking right about now. It is midnight in American Samoa at 6:00 a.m. ET. If you’re on eastern time, you should probably switch to coffee. If you think you’ve had a long night, remember that the International Space Station rings in the new year 16 times. That’s 16 attempts at remembering the words to “Auld Lang Syne.” In a tiny space capsule. Happy 2019!